Sign up for SWWG emails! This year’s SWWG event is a full-day workshop focused on issues and tools around the theme “Protecting Our Water.” The pre-determined issues will include: Quantification - how do we figure out how much we actually have; Beneficial and Reasonable Use in the Sierra - What do with what we have; Quality - source protection, legacy mining, forest planning, etc. ; and how do we interact with the pressures on and interests in the sierra water supply exerted by the needs of the rest of the state - particularly in times of drought and in light of climate change. We will spend the day framing questions about how these issues can be addressed with specific tools and concrete action, including timelines and assignments, as opposed to simply doing additional planning. We will investigate the trending policies regarding these issues in California and how are dollars expected to follow those policy trends. Come prepared with your region’s specific high-priority concerns framed by the broad issues above and receive consultation from big shot lawyers and issue and policy experts. There will also be time for mingling and networking. We can’t wait to see you again, or for the first time, this year! To collaboratively engage regional stakeholders in water supply, water quality and disadvantaged community discussions with legal experts and provide in-depth strategies to protect our watersheds and water resources in the future. Over the past three years the SWWG has organized conferences in the Sierra Region (2012-2014) to discuss and educate multiple IRWMP stakeholders on water issues specific to headwater regions. Many of our evaluation form comments and conference discussions revolved around the idea of a future smaller venue to discuss and strategize on the best methods for protecting our water resources. 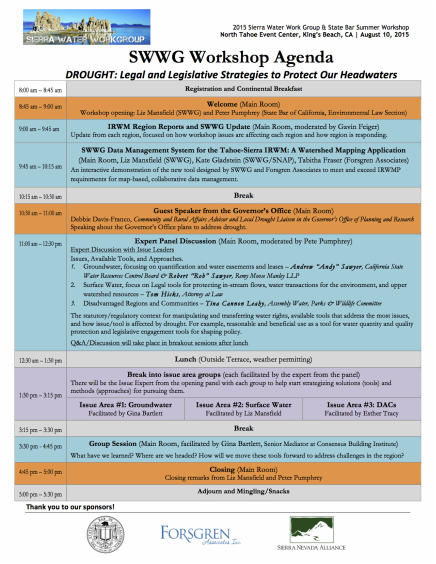 The SWWG, in collaboration with the California State Bar, has put together a one-day workshop to address three critical headwater issues: Groundwater, Protecting In-stream Flows, and Disadvantaged Regions and Communities. The California State Bar, Sierra Nevada Alliance, and Sierra Nevada Conservancy have been valued collaborators and sponsors of the SWWG Conferences and the upcoming Workshop. This year the California State Bar has been instrumental in planning and coordinating this workshop for all IRWMP stakeholders. Groundwater Issues - Focusing on quantification and water easements and leases with legal experts Andrew “Andy” Sawyer, California State Water Resources Control Board & Robert “Rob” Sawyer, RMM Law. · Groundwater legislation and the required management plans, regulation, and authorities overlapping with IRWMP jurisdiction and planning. · Linkages and relationships between surface water and groundwater supply. Conjunctive use and overdraft will exasperate these interactions. Surface Water - Focusing on protecting In-Stream Flows - Legal tools for protecting in-stream flows, water transactions for the environment, and upper watershed resources with legal expert Tom Hicks, SEM Law. · Reasonable and beneficial use of water in the upper watershed has been questioned. Disadvantaged Regions and Communities with legislative expert Tina Cannon Leahy, Assembly Water, Parks & Wildlife Committee. · Water quality issues can be exasperated by drought conditions many DAC’s will not be able to meet their water quality standards. SWWG Data Management System for the Tahoe-Sierra IRWM: A Watershed Mapping Application. Kate Gladstein and Tabitha Fraser. Guest Speaker from the Governor's Office. Debbie Davis-Franco. ﻿﻿Groundwater, focusing on quantification and water easements and leases﻿﻿. Andy and Rob Sawyer. Disadvantaged Regions and Communities. Tina Cannon Leahy.